Basil mashed potatoes combine the silky texture of potatoes with the smooth feel of olive oil. We add basil to the oil to intensify the flavor. Set it and forget it. 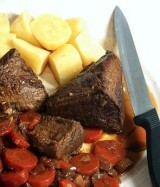 In a little over 3 hours, you will be enjoying a robust hearty roast, along side a smooth, rich pan sauce. Serve with roasted or mashed potatoes. Blueberry salad dressing is flare free alternative to the citrus dressings. The flavor is bright but not to powerful, a perfect addition to crisp greens and fruit. Rice pilaf is a classic dish that pairs well with any protein. By baking this dish, we allow time for the other parts of your dinner to cook without having to worry about the rice. I also substituted apples for onions in this recipe, and it worked perfectly. Peanut butter buckwheat porridge is packed with dietary fibers and very low on saturated fat. 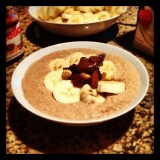 I made this with a drop of Nutella, but any safe nut butter will work! Enjoy. Using bulgur wheat is an excellent way of avoiding the high carb value of the classic bread stuffing. 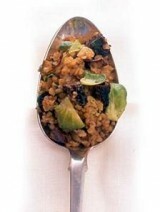 Adding brussel sprouts and mushrooms takes the earthiness of this dish, over the top!